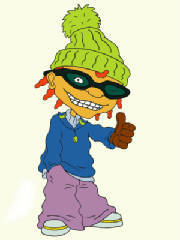 It's Otto Rocket from Ocean Shores! I love to do grinds on Raymundo's floor! While I surf with my friends. At Madtown, I take flight! At the beach, I hang ten! Say that I am the man! I make the competition look like fools!